In this item, United States Indian Agent Frank Frantz, who served as an officer with the Rough Riders during the Spanish-American War, responds to a letter sent by Kansas State Historical Society Secretary George W. Martin. While Frantz admits that he is new to the Osage Agency, he does provide important details on the Osages' current way of life. 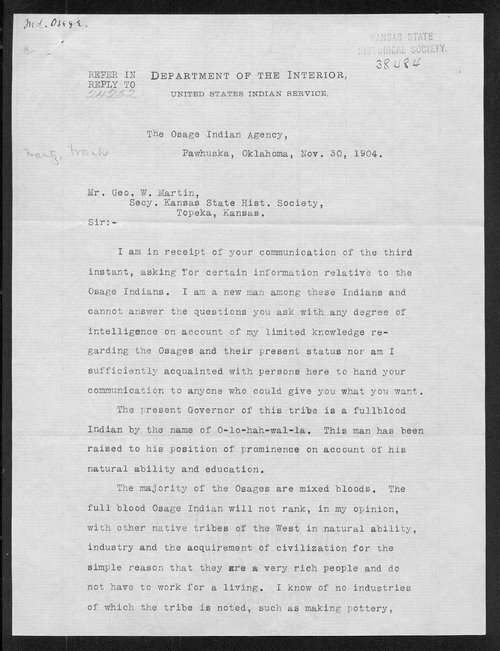 Frantz explains that the Governor of the tribe was a "fullblood" named O-lo-hah-wal-la who had been "raised to his position of prominence on account of his natural ability and education." Frantz also points out that a number of younger Osages were attending "Carlisle, Haskell, Chilocco and other nonreservation schools, including some of the best colleges and academies in this section of the country."